The pint-sized power packing dynamo from Screaming Females has just released her first solo album, don’t let the band name Noun fool you, this is all Marissa Paternoster. Having shaved down some of the rougher caterwauls and the pogoing bass lines that color Screaming Females records, Holy Hell finds Paternoster employing pianos, along with her 6 string mastery and a more personally direct lyrical approach; there is an honesty here that draws you in. “Black Lamb” the disk opener is a piano walk-through that cryptically deals with loss and power struggles. The tune eerily drifts away leaving unsettled before the distortion and fury kicks down the doors on “Outerspace” squiggling and screeching. Paternoster is a guitar goddess but Holy Hell disregards technical flair and focuses on questioning, personal matters and tone. “Pearly Gates” is a mystery of lover fueled lyrics (“I draw your veins/onto my window pains/and then I sign your name/across the floor”) over crunching layered guitars as is “So Rough” with its plainly honest chorus of “How did it end this way/I miss you day to day”. The flirting with epic “Call Earth” soars on piano before a fluid guitar line takes the track to the mountain top and the disk closer “Talk” sounds naked and angelic with a splash of isolation. 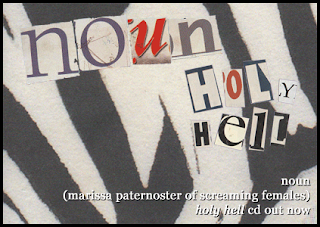 An introspective work of art that seems to have been recorded at a crossroads in Paternoster’s career/life, Holy Hell is an open book that can rock or remain distant with equal ease, rewarding upon each listen.